When in doubt, make it up. I had some potatoes that I needed to use up and soup seemed like the perfect option. (Despite being summer, we love eating soup all year round). So, I looked through my cookbooks. And then I looked online. Neither of these sources gave me what I wanted. 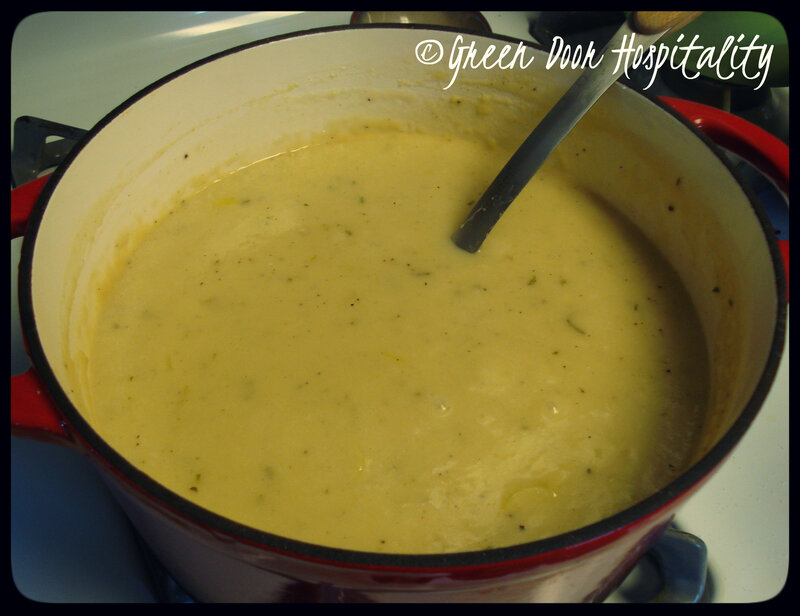 I wanted a good and creamy potato soup that could be made with ingredients I had on hand. So I looked at some of the basic instructions from a couple different recipes, and I created my own. I’m including this as part of the Let the Inspiration In Challenge because often times inspiration is small and truly comes from within. I couldn’t even tell you a specific source that I was inspired by. It was multiple online recipes and physical cookbooks and I just looked for common denominators so that I made sure the ingredient ratios would be close. And the rest was just me looking in the pantry and fridge and seeing where the inspiration took me. The results were perfect. Creamy, flavorful, and it used up my potatoes. Exactly what I was looking for with this soup. Peel and roughly chop potatoes and boil until soft. Drain water and mash to desired consistency. Set aside. In a dutch oven (or large pot), melt 1/2 cup butter and then whisk in flour to create a roux. Add milk, vegetable broth, and 1/4 cup butter and whisk until combined. Bring to a boil. In the meantime, saute chopped onion and shallots with the remaining 2 Tbs of butter. Add chopped rosemary. *By the way, shallots and rosemary sauteed in butter makes one of the most amazing aromas that can ever come from a kitchen. Forget baking, if we ever sell this house, I’m going to saute up some shallots and rosemary to entice potential buyers! * When onions and shallots are becoming transparent, add the diced garlic for the last minute or so of cooking (this way it won’t get too browned/burnt). Once dutch oven contents are starting to boil, add potatoes and shallot mixture. Whisk together and then add salt and pepper to taste. Cover and let cook over medium heat for 10 minutes. Uncover and add chili oil to taste, as well as any more salt and pepper desired. Continue to cook at low heat while you stir occasionally for 5 more minutes. Turn off heat and add shredded cheese. Combine thoroughly until cheese has melted into the soup. Do a final taste test to see if any more seasoning is needed. Ladle into bowls and enjoy! I am going to give this a try when it gets cooler out. Sounds great. Thanks! The rosemary and the cheddar really make it something special! This entry was posted on July 16, 2012 by Jessica Romigh in Casual Dining, Let The Inspiration In Challenge, Recipes, Soups and tagged A Taste of Morning, Aged Cheddar, chili oil, creamy potato soup, dinner, Entertaining, food, Kenley's creamy potato soup, Let the Inspiration In Challenge, potato soup, potatoes, Recipes, russet potatoes, vegetarian.